Benjamin Silver, MD is an orthopedic surgeon specializing in total joint replacement and complex reconstruction of the adult hip and knee. 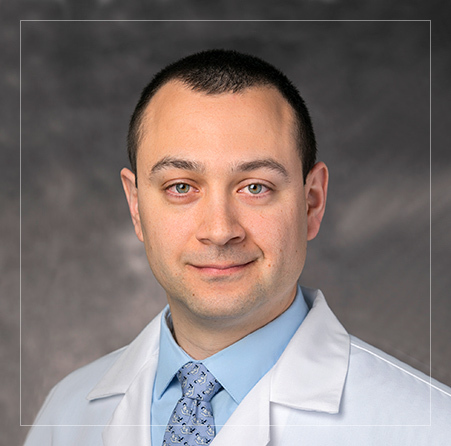 He is a clinical assistant professor of orthopedic surgery in Case Western Reserve University Medical School’s Department of Orthopedic Surgery, and a member of the Division of Joint Reconstruction and Arthritis Surgery at University Hospitals Geauga Medical Center. His special interests include minimally invasive direct anterior total hip replacement, minimally invasive muscle sparing total knee replacement, partial knee replacement, complex primary joint replacement for post traumatic and congenital deformity, and revision surgery for mechanical and infectious complications of total hip and knee replacement. In addition, Dr. Silver cares for general orthopedic conditions including the operative and non-operative treatment of fractures and trauma, musculoskeletal infections, and other bone and joint conditions. Dr. Silver grew up in Rochester, N.Y. and attended Brighton High School where he was captain of the football team. He is a graduate of Columbia University with a degree in biology, and the New York University School of Medicine in New York. He completed residency training in orthopedic surgery at the University of Texas Southwestern Medical Center in Dallas. Following that, he was a fellow in orthopedic adult reconstruction and complex hip and knee replacement at Allegheny General Hospital in Pittsburgh. During fellowship, his focus was on complex hip and knee revision and the use of cutting-edge robotic assisted techniques for total joint surgery. He lives in Beachwood with his wife Avielle, a University Heights native, and their two daughters, Lianna and Nora. In his free time he enjoys traveling, hiking, woodworking and cheering on the Buffalo Bills with his family.